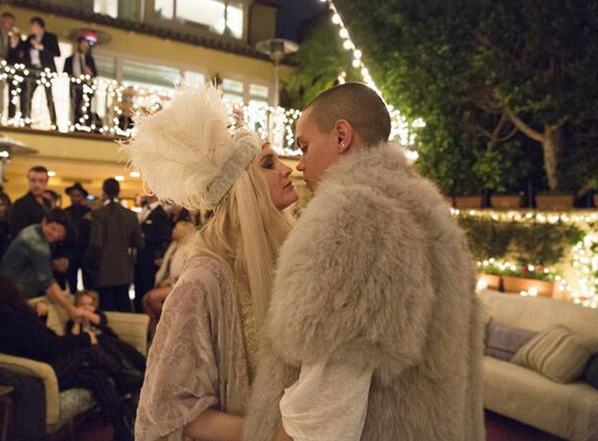 Ashlee Simpson and Evan Ross host their engagement party for family and friends. Ashlee Simpson and Evan Ross are ready to say "I do." The pop singer, 29, and the actor, 25, were joined by dozens of friends Wednesday to celebrate their upcoming nuptials. "What an amazing engagement party with all of our loved ones! We gettin' married," said Ashlee, who posted a picture of herself kissing her future husband on Twitter. Ashlee's famous older sister Jessica Simpson also shared a snapshot from the soiree on Instagram. "Celebrating my best friend and sister @missbananahammock @ashleesimpsonofficial. I love her so much!" she wrote. The couple wore matching ivory and silver looks, with Ashlee modeling a caftan and a feathered headdress and her fiancé sporting a short-sleeved fur coat and diamond earrings. Jessica, who lost an estimated 60-70 pounds via Weight Watchers, showed off her slim shape in a white and silver mini. It was an extra special event, as it also happened to be Evan's mother Diana Ross' 70th birthday. The "Bat for a Heart" singer and the Hunger Games: Mockingjay – Part 1 actor got engaged in January 2014 and could tie the knot any day now. "Honestly, we could go and get married right now, wherever," Evan told E! News' Marc Malkin a few weeks ago at SXSW in Austin, Texas. "We just want to be married. We're in love. This is the most incredible time I could ever think of in my life and I'm young, but the same time, I've lived a different life than most and I can't think of a happier moment." Luckily, Diana is helping the couple plan every aspect of their wedding. "She's involved in all levels of my life. She's one of the most incredible mothers ever," said Evan, who next appears in the indie The Wilderness of James. "She's involved in every piece of our wedding [and] engagement party. This will be the second trip down the aisle for Ashlee, who was wed to Fall Out Boy's Pete Wentz from 2008 to 2011. Together, the amicable exes share custody of 5-year-old sonBronx Mowgli Wentz. Yeah! I saw a pic of him on MTO (yeah, I know) anyway the pic was of him and some muscular guy ramming his backside, with Evan's face grimmacing, eyes closed, mouth wide open, but they identified him as Bow Wow. Most commenters thought it looked like Evan, including me. That pic is floating somewhere out there in the internet land of shame.